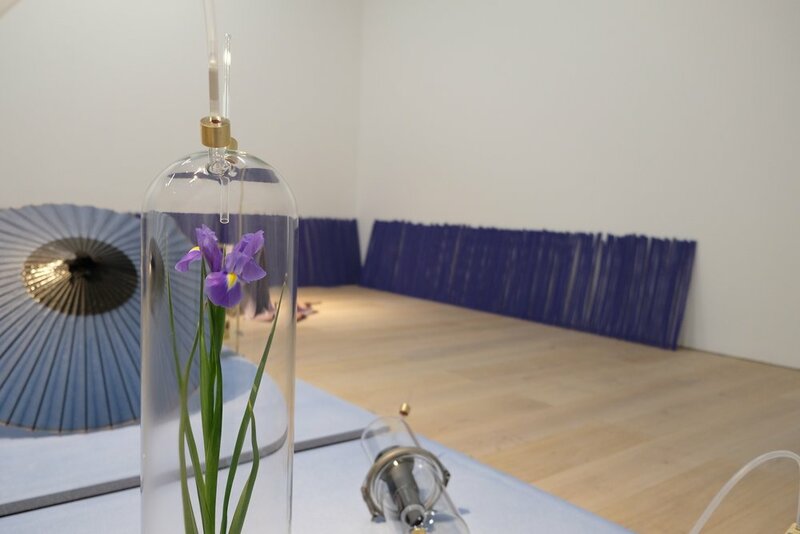 Dane Mitchell's solo exhibition Iris, Iris, Iris is on view at Auckland Art Gallery in Auckland, New Zealand. Mitchell has a long-standing interest in invisible forces. Over his career this has seen him develop processes, strategies and a scientific-like enquiry into subjects ranging from the hidden workings of the gallery system to spirit forces and more recently, weather, scent and speech. Mitchell's exhibition examines the entanglement of our senses, the ocular and the olfactory. The iris in its multiple forms–as plant, as body part, as technology, as myth–is employed as a poetic device to make connections between two ways we encounter the world: through the eye and through the nose. Iris, Iris, Iris is the result of recent research into scent production, from traditional Japanese incense to the latest fragrance technologies. The installation explores differing meanings of the word ‘iris:’ the name of a flower, the colored part of an eye, the adjustable aperture of a camera and Greek mythology’s rainbow goddess. It features aroma molecule extraction technology, combining the ‘invisible’ materials of incense and perfume with items related to the act of seeing. Iris, Iris, Iris was curated by Zara Stanhope, former Head of Curatorial, Auckland Art Gallery, and Mami Kataoka, Chief Curator, Mori Art Museum, Tokyo.